So once eggs are boiled and cooled peel them.. Tough shells on good duck eggs! 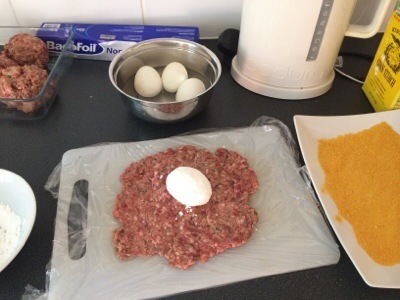 Take the Mr Fitz welsh dragon venison sausage meat.. Flatten it out.. Place peeled egg atop.. Fold meat over the egg .. Ooh I also roll the egg in cornstarch . Seems to help it stick better.. This trick is easier done with either wet hands or in clingwrap..
Form into a ball.. A big canon ball in this case.. Roll around on golden breadcrumbs .. You gotta do the breadcrumbs for the crunch..
Sure you could pop them into the oven .. And bake em.. Yet I like to get them started in a pan of Mrs Middletons rapeseed oil.. It gives them a neat headstart..
Then into the oven till you think they are done! The venison meat makes for a lovely soft texture against the crunch if the crumb and the rich almost chewiness of the egg.. Season with chilli and garlic salt .. They are pretty heavy so I reckon you will be surprised at just how filling these are.. I believe the phrase ‘get in my face’ is apposite. Game is hard to come by in Bangkok but back in the uk over Christmas so will hopefully source some and have a go. Cheers! These look very delicious–thanks for demystifying them! No worries! Try them out! Any egg any meat! I’ve never even heard of scotch eggs before, but these look incredible! I think I could only have one, duck eggs and venison are so rich and delicious. But what an awesome food! To be fair one is more than enough! Thanks for noticing! 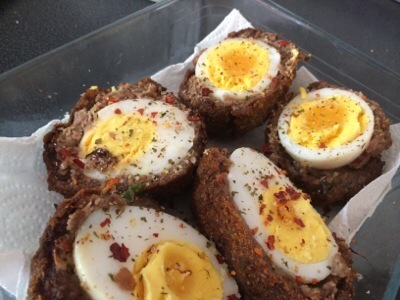 Mmmm…scotch eggs…I’ve been seeing these everywhere, but have not tried them yet. 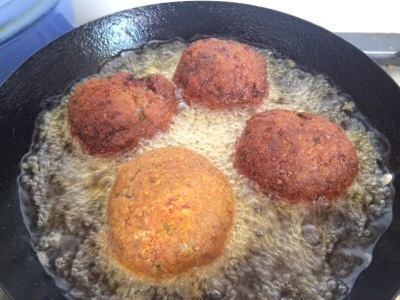 Yours look delicious, and with such a nice crunchy texture on the outside to contrast with the softness of the egg. YUM! Wow! How creative! This sounds so good! Gamier meat is definitely something that I need to get into. But where can a city-slicker find venison? Ha ha! .. Gotta be a supplier in NYC? Or maybe try ‘catch’ one in a park.. Ahem..
I’ve always wanted to try scotch eggs, but they intimidate me. Good for you! I’m a playing it safe kind of gal, but who knows…maybe I will make use of all the dyed Easter eggs my kids will be making in the next few days??? Maybe that’s not such a good plan ! !